During one of the most painful and fragile points of his life--with his dreams as a young husband and dad having taken a nosedive--Paul Martini was depressed and feeling hopeless. But since then, he says, God has turned his mess into a message and given him life lessons about the power of peace. Discover the power of God's peace to sustain you through the storms that challenge your destiny. Includes a foreword from Randy Clark. Paul Martini, director of events and an associate evangelist with Global Awakening, travels the world extensively, training, teaching, and imparting the gifts of the Holy Spirit. He is a 2011 graduate of Global School of Ministry and an MDiv candidate at Regent University. He has served Randy Clark with honor and humility, traveling with him for more than four years. Paul is blessed with his beautiful wife, Ruth, and his six children, Giovanni, Giuliana, Shiloh, Freya, Oscar, and Charlotte. He is based at Global Awakening's headquarters in Mechanicsburg, PA. 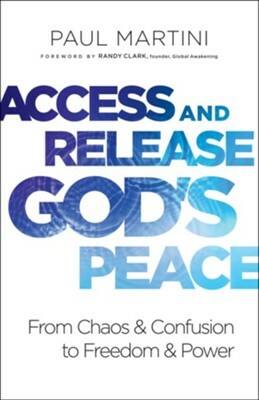 I'm the author/artist and I want to review Access and Release God's Peace: From Chaos and Confusion to Freedom and Power - eBook.